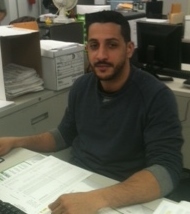 Please join us in welcoming David Collado to our Accounting Department in Maspeth, NY. David grew up and lives in Brooklyn so his commute "aint that bad." David spends his free time working out and shooting pool. While he's no Minnesota Fats, he holds his own in the various billiards leagues in which he competes. We have a feeling David will bring his strength in angles and numbers from the pool table to the accounting department. CONGRATULATIONS and WELCOME David from everyo... read more.